Epidemiology and risk factors of haemorrhoidal disease are not well defined. 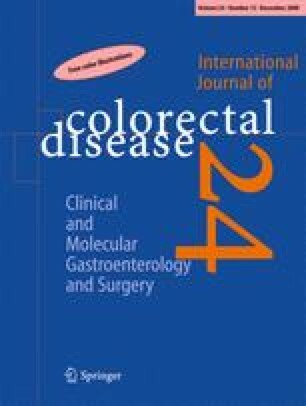 This study tried to evaluate if the appearance of haemorrhoids is related to a disturbed remodelling of the soft tissue of rectal mucosa and submucosa. Therefore, immunohistochemical expression profiles of five parameters as potential mediators in neoangiogenesis (EGFR), in inflammatory cell activity (COX-2), and in cell migration, differentiation, and wound healing (notch-3, c-myc, and ß-Catenin) were analysed (Saed et al., Fertil Steril 83(Suppl 1):1216–1219, 1; Saed et al., Fertil Steril 79:1404–1408, 2; Stojadinovic et al., Am J Pathol 167:59–69, 3). Haemorrhoidal tissue specimens were collected from 44 patients. Healthy rectal mucosa was obtained from 16 non-fixed fresh cadavers and served as control. Histological and immunohistochemical markers like EGFR, COX-2, notch-3, c-myc, and ß-Catenin were analysed semi-quantitatively, separately for mucosal and submucosal layer. Significantly increased expressions were found for EGFR, COX-2, and notch-3 in the mucosal and submucosal layer of haemorrhoidal tissue in comparison to normal rectal tissue. This finding confirms that haemorrhoidal disease may be regarded as a manifestation of a soft tissue disease. We are grateful to Mrs. Ellen Krott for most excellent and careful assistance during this investigation.